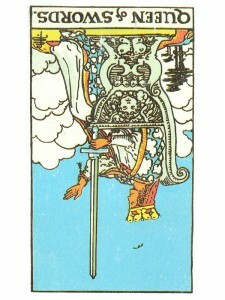 Queen of Swords (R) says cut through any roles, masks or defenses present in yourself or your relationships. Accept your desire to be authentic with the people in your life. Recognize the people in your life who are intolerant and have a narrow outlook – they will find it difficult to see anyone else’s point of view. Their perception is keen but it is also deceiving because their overemphasis on sorrow makes life worse than it is – their mind tends to ignore the good things around it. Be aware of the workings of your mind – understand how you create problems. A strong mind can create a very negative reaction to the pain or pressure that is experiencing from an unpleasant situation or person and when opposed – the mind can become so forceful that it actually “expects” or demands that everyone does what it wants. This mind can turn malicious and narrow minded, using its attitude to force its personality on the people around it. When and if this occurs, whether because of sorrow or egoism – this mind has lost its commitment to truth. Keep your clarity and your focus even amidst doubt, distractions and confusion. Maintain your mental balance and you will KNOW the truth. An aggressive woman vs. unrealized potential. A mother too busy for her family vs. the mother who is always there, looking over your shoulder. Bad planner vs. the over planner. Idealist to a fault. In the first position: You will be called on to be the champion for many who need your courage. In the second position: At one extreme you may try to be much more independent than is necessary or wise. In the third position: This suggests that you are needed to help another or others with their mental house, to improve communication and bring order. In the fourth position: At one extreme, you may be driven to achieve, to establish control over your affairs and if needed, the affairs of others. In the fifth position: You may think adversely about this queen or she about you. As an aspect of yourself, you may be avoiding thinking about your mental affairs. In the seventh position: If this represents someone already in your life, this may show a turn of mind between you. There may some fear of authority. Or, there may be abuse of authority. In the eighth position: Just who does this queen think she is anyway? The problem here may be in how to get her out of your house while you still can. In the ninth position: Your heart may be involved with this queen, but rather not be. Or, the opposite, this can be the symbol of your hearts sadness over this person.